Thanks to my friend George Baloglou, I'm passing on this news item from in.gr, on a new documentary on Tsakonian. Translations mine. THESSALONICA.—The visitors of Leonidio in Arcadia are welcomed by a sign saying Καούρ εκάματε, which in the Tsakonian dialect means "Welcome". The directors Elisavet Laloudaki and Massimo Pizzocaro have attempted to record the Tsakonian dialect in the villages of Cynuria, in their documentary titled Α Γρούσσα Νάμου "Our Language", to be shown in the 13th Documentary Festival of Thessalonica. "We went into homes and cafés and heard moving stories. We realised that the language is dying, but unfortunately it is not dying on its own. 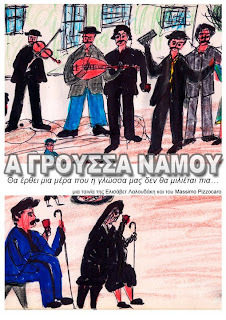 Together with the language, an entire way of life is vanishing," director Elisavet Laloudaki told the Athens News Agency. "Our aim was to try to convey the relaxed atmosphere prevalent in the region; to make a movie on a language that is disappearing, but which would be light and alive, like a cool breeze." As the documentary directors observe in their description, "Tsakonians belong to the old world. Their contacts with strangers, their opening up to tourism, immigration, modern life has only minimally altered the structures and rules of their closed society. In fact, it's not that they are seeking to be isolated; they are just displaying an obstinate refusal to accept these developments." "Their persisting with the Ancient Doric language when the whole world around them, even non-Greeks, were adopting Koine is only one aspect—perhaps the most extreme—of their reluctance to change. In this sternly delimited environment, boundaries are very important, almost sacred. In Tsakonia, a stranger does not easily go into a home—and that's final." "So at least in our case, the camera was not an intruder. Homes were open, talk was free, space was unconfined. Our demands were minimal: we asked them not to talk about the language, but to talk in the language—that is, to allow us to show their world," the two directors add.